According to a study by BuzzFeed on the last three months of the 2016 US Presidential Election, fake news accounted for 8,711,000 shares, reactions, and comments on Facebook. Only 7,367,000 shares, reactions and comments on Facebook. Fake news isn’t just an American problem. Mashable reported in 2017 that at least 17 countries highlighted that fake news has influenced their country’s elections. 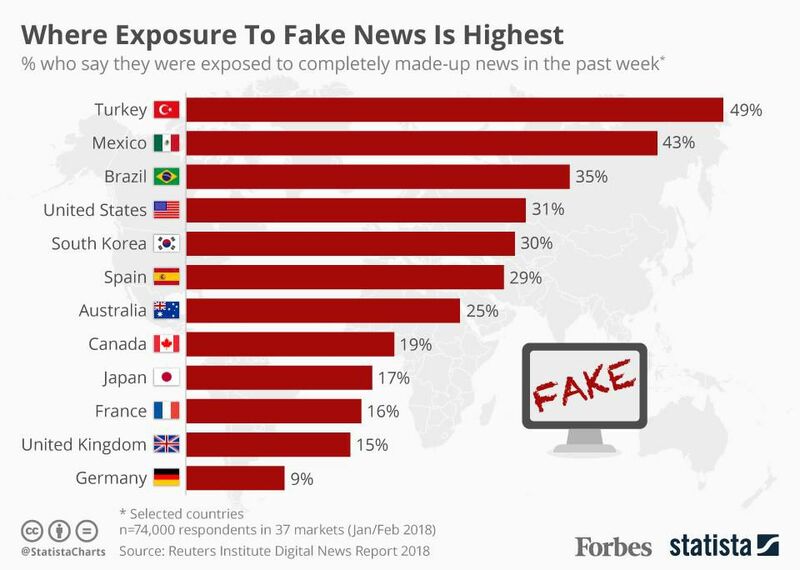 And a survey done by Forbes and Statista reported that almost half the people of Turkey said that they were exposed to completely made-up news in the past week. While Facebook has taken positive steps to eliminate this scourge, fake news (or false information) may be so widespread and deceptively cloaked that it is difficult to completely eliminate it. Here in Singapore, the problem got so bad that a Parliamentary Select Committee has unveiled 22 recommendations to battle this digital malady. They include legislation, working with technology companies to proactively bring down fake content on their platforms, and creating a national framework to guide public education on falsehoods. This eventually resulted in the Protection from Online Falsehoods and Manipulation Bill, which was tabled in Parliament on 1 April 2019. Those found guilty of spreading online falsehoods with a malicious intent to harm public interest could face jail terms of up to 10 years. But first, let us define what Fake News is. Fake News is untruthful and deceiving news that is deliberately fabricated to fulfill an agenda. They include outright lies, fictitious stories, political propaganda, hoaxes, fraudulent click bait, deliberate misinformation, and other falsehoods. 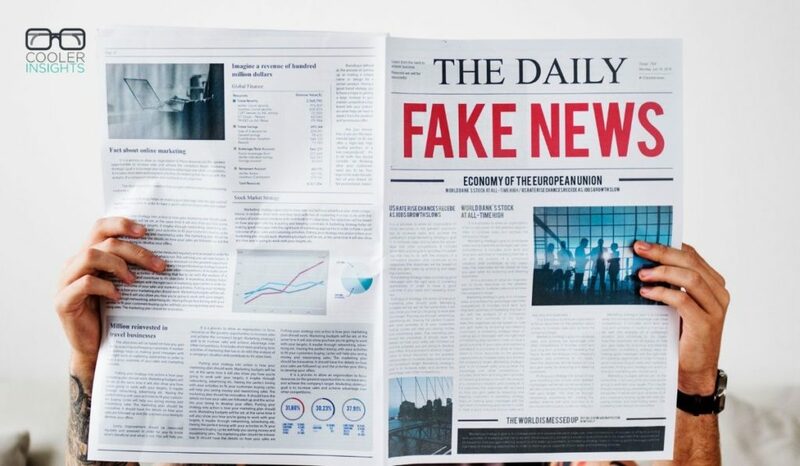 Often, fake news is created to malign or smear the reputation of an individual, organisation, product, government or institution for the purpose of financial, political, corporate or individual gain. Popularized by US President Donald Trump following the 2016 US presidential elections, it is part of what some may call a “post-truth” era in politics. While printing and circulating misleading information isn’t anything new, the advent of social technologies has greatly accelerated the pace in which Distortions, Rumours, Untruths, Misinformation, and Smears (aka DRUMS) are produced and disseminated. False stories outperform the truth on every subject—business, terrorism and war, science and technology, and entertainment. However, false stories about politics regularly performed the best. As you’d imagine, there are tonnes of false information and fictitious content that are packaged as “news” on the Internet. Purveyed by online versions of tabloids, they are often driven by political, religious, commercial, and other vested interests. 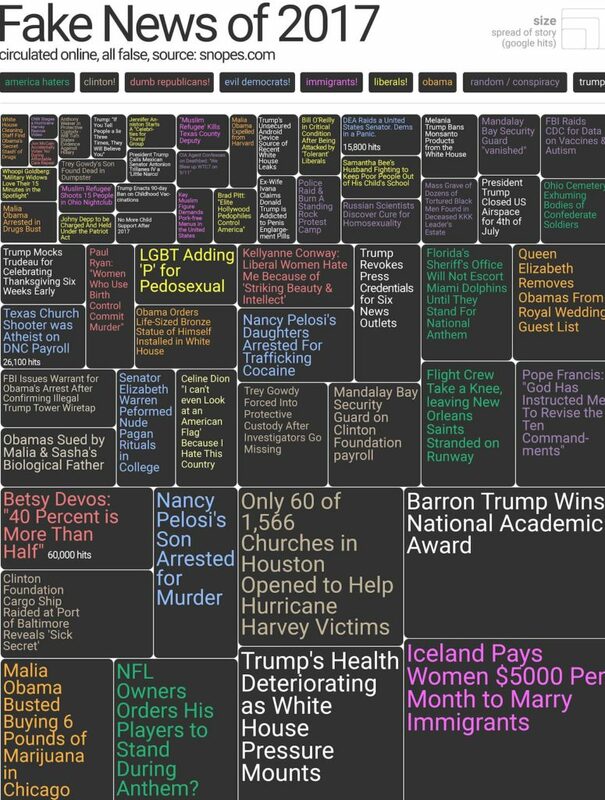 Here are some of the biggest fake news in 2017, based on the inputs from fact checking website Snopes. Was Keanu Reeves a Real Life Hero? Did Keanu Reeves really pay for a stranger’s kidney transplant with an envelope of cash? And did he praise President Donald Trump as a role model? Find out the answers here and here. Does Temasek Holdings Invest Our CPF Funds? This old chestnut has been around for so long, but the truth is that they don’t. Read this article to learn how CPF funds are invested, and these FAQs to learn how Temasek acquires its investment capital. Or you can watch this video to learn more. Why Do Fake News Occur? OK, so we know that there are many reasons why political parties or commercial entities may want to generate fake news. After all, money and politics are two of the strongest reasons for anything to happen. But why do so many people (including ourselves) still fall prey to such online lies, despite being purportedly smarter, more well-educated, and well-informed that our predecessors? First, and perhaps most importantly, we humans are irrational creatures. While the world has shifted considerably from a hunter-gatherer to an information-based society, the way our brains and nervous systems work have not kept paced. Our psychologically foibles makes us wired to behave in ways vulnerable to the influence of fake news. Confirmation Bias: This is our inclination to search for, consume, prefer, and remember information that aligns with our existing beliefs or hypotheses. Anchoring Effect: Having ‘lazy’ brains, we usually latch on to the first thing that we’ve read, heard or viewed. This is why it pays to be the first to the market for information. Authority Bias and Halo Effect: We tend to accord far too much respect to people in positions of authority (eg celebrities, leaders, religious icons, or academics), even in areas that they do not have expertise in. Thus, we will buy a health supplement launched by a Hollywood star even though the person may not know a thing about healthcare. Groupthink and Bandwagon Effects: Nobody wishes to rock the boat, especially when they concern our family, friends and colleagues who believe in a certain idea. Coupled with the bandwagon effect whereby we imagine that crowds cannot be wrong, they present a double whammy to good thinking and lead to poor judgement. The Dunning-Kruger Effect: This is the phenomenon where we believe that we know more than we actually do. Interestingly, the people who have poorer knowledge, skills or reasoning abilities are more likely to overestimate how much they know! Social influence is the change in behavior that one person causes in another, intentionally or unintentionally, as a result of the way the changed person perceives themselves in relationship to the influencer, other people and society in general. Social Currency: Whatever we share that makes us look good to others. This motivates us to warn our social networks about the ill effects of drinking tap water, how immunisation may cause autism, or other urban myths. Storytelling Effects: Unfortunately, the same effects which a good story may have in eliciting positive change could be misused for deviant purposes. In fact, content wrapped in stories are 22 times more memorable than facts alone. Mirroring: While we’re not monkeys (technically speaking, we’re apes), we do suffer from the “monkey see, monkey do” phenomenon of mirroring others around us. Social Proof: Notice that when a piece of content snowballs on Facebook, it tends to garner more and more likes, comments and shares as it “goes viral?” This is due to the social proof that we see – the more we see others (especially those whom we know) liking and commenting on a post, the more likely we are to believe that it is true. Last, but certainly not least, fake news gets spread due to the nature of online algorithms. A filter bubble is a personal online zone of highly customised content such as news, ads, videos, articles, images, and social media posts. It may include tailored search results, targeted ads, and related videos, as well as prioritized newsfeed content from specific individuals or organisations that we frequently engage with online. Also known as a “bias bubble,” they are responsible for prioritising your newsfeeds to see content from those whom you engage most often with, and serving ads that you’re more likely to respond positively to. The reason technology companies do this is simple: they’d like their users to enjoy using their networks by offering them content that they’re more likely to enjoy. This applies to virtually all social networks and search engines – from Facebook, Google, Twitter, Instagram, LinkedIn, YouTube, Pinterest and more. Thus, a liberal who wishes to champion minority rights issues may see more and more of such content on his newsfeed, while a conservative who is anti-abortion may see more and more of such content on her newsfeed. Don’t be hasty in wanting to be the first to comment on a post, share it, or get the news out. Speed is NOT of the essence when it comes to sharing possibly untrue content. Instead, step back from your device. Take a deep breath. Pause. By doing so, you can override your amygdala – that primitive lizard brain which causes you to “fight or flight” – and engage your higher cognitive faculties. In a world swimming with DRUMS, it makes sense to poke your head above the water and see that piece of content for what it truly is. Question why that news item was produced. Interrogate in your mind what it could possibly mean. Remember that everybody has an agenda. One of the critical errors made by people who spread fake news is that they do not examine where the content comes from. Who took this photo? And who wrote the caption under the photo? Who is paying the bills here? What is the background of the organisation or person behind this? What would they stand to gain? Does it make your heart beat faster? While credible news sources do also employ emotional click baiting techniques to get readers excited, chances are that such techniques are often carried to extremes by false news purveyors. EXTRA: Emotions that get you hot under the collar like anger, anxiety, amusement, and excitement tend to generate more social sharing than more docile emotions like sadness or contentment. Read my article on Contagious Content to learn more. Something major like the death of Morgan Freeman, or the fact that President Donald Trump has 10 illegitimate children ought to be reported in other major news channels. If it isn’t, then its probably a gigantic red flag. There are several tricks which fake news websites use to fool people. Both photos and videos can lie too. With the state of photoshop and digital video enhancement technology reaching its zenith these days, even images can be faked. One way to check on this is to use Google’s Image search and do a reverse image search to check if similar photos were used elsewhere. Remember slowing down? As you do so, read through the piece or view the video carefully (if it warrants your time that is). Are there spelling and grammatical mistakes in the piece? Do the punctuation marks look out of place? Are the sources interviewed in the piece properly quoted? Do they look like real persons? Is there proper credit for the content cited from other sources? What about flow? Does it read like a professional journalist’s work? Sometimes, reading more than one piece of content may help you to better verify if its legit or fake. Check to see if there is a common thread running through the articles or videos. Is there an agenda behind them? Do they consistently skew towards one side of the argument? OK, maybe not all of them. But getting more eyes and ears to go through a piece of content always helps. Just make sure that they’re sufficiently well-informed and neutral-ish in their views of topics. Finally, consider finding ways to burst your filter bubble. Go into your social media profile settings and change your privacy settings. Opt for “Most Recent” on your Facebook, Twitter or LinkedIn newfeeds rather than the default “Top Stories” setting. Wherever possible, try to reach out to folks whom you have not seen in a while on social media, and engage with their content. Move outside of your usual social circles. If you are using a search engine like Google, choose the private or incognito mode when you are surfing. In his excellent book Think Before You Like, former journalist Guy Harrison encouraged us to think, act and behave like scientists whenever we come across questionable content. Thinking like a scientist means embracing doubt, being sceptical, doing your own research, coming up with your own hypothesis and verifying it, and conducting your own tests. It also requires you to share what you’ve learned with smart and sensible people to seek their inputs. I believe that this is an excellent way to deal with the social media scourge of fake news – an important takeaway for all of us. Need to equip yourself better online? Check out these resources by the Media Literacy Council!